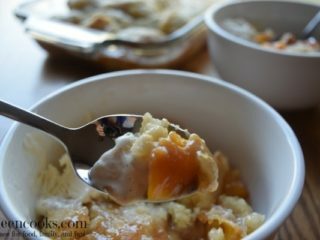 Peach cobbler is one of those traditional summer desserts I fantasize about all year and look forward to eating just about as soon as I can get my hands on some ripe peaches. 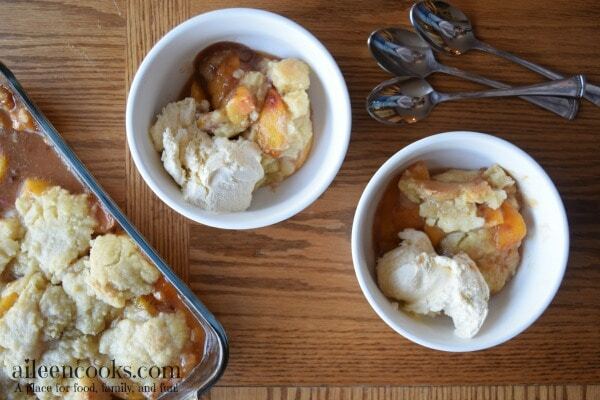 The sweetly baked peaches paired with the chewy cobbler are all you want in a summer dessert. Pair it with a scoop of vanilla bean ice cream and you will be in heaven. I’ve been making this same recipe for my family for several years now. 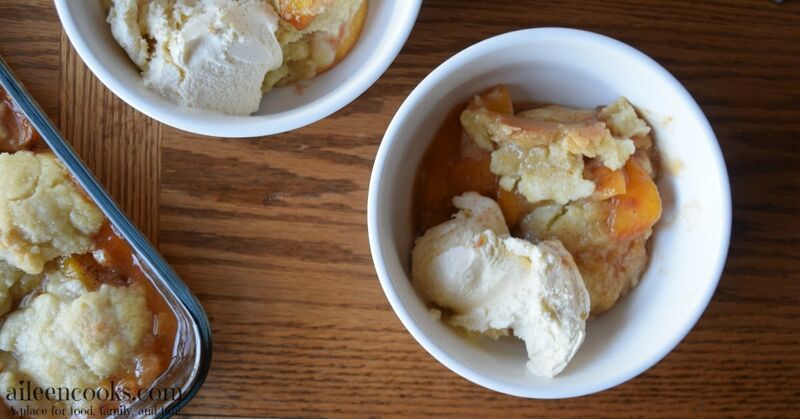 I’ve tweaked it here and there to come up with the perfect peach cobbler recipe. And that’s what it is. Perfect. Back to this delicious peach cobbler. You can use either fresh or frozen peaches for this recipe. Although, if peaches are in season, I always recommend using fresh! Just be sure you are buying the freestone variety of peaches. Freestone peaches separate easily from the pit so you don’t lose a bunch of fruit while slicing and keeps them looking pretty. If using frozen peaches, be sure to defrost and drain the peaches first. As long as you don’t skip this step, you will still be met with tender, sweet fruit topped with a delicious cobbler. Yum. 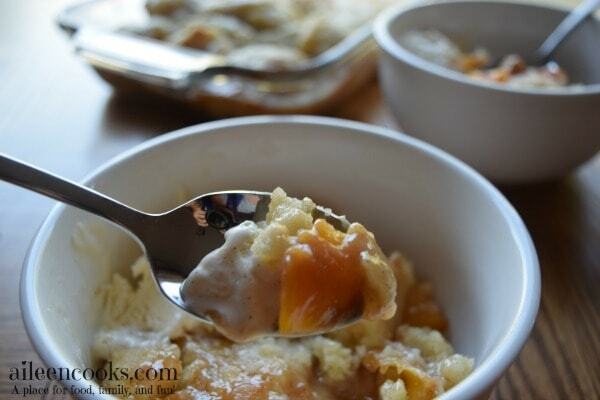 Enjoy the wonderful taste of summer with this delightful peach cobbler recipe. Preheat the oven to 350 degrees. Grease a 2 quart casserole dish and set aside. In a large bowl, combine the peaches, light brown sugar, 1/4 cup granulated sugar, corn starch, lemon juice, cinnamon, and vanilla extract. Pour into the greased casserole dish. In a medium bowl, whisk together the flour, remaining 1 1/2 cups granulated sugar, melted butter, and salt until a crumbly dough forms. Using your hands, scoop up golf ball sized portions of the cobbler dough and press into disks. If the dough does not stick together, mix in a bit of water (1 tablespoon at a time). Arrange the disks of cobbler dough on top of the peaches in an overlapping cobblestone design. Top with the chilled cubed butter. Bake for 45 minutes, or until the cobbler begins to turn golden brown. 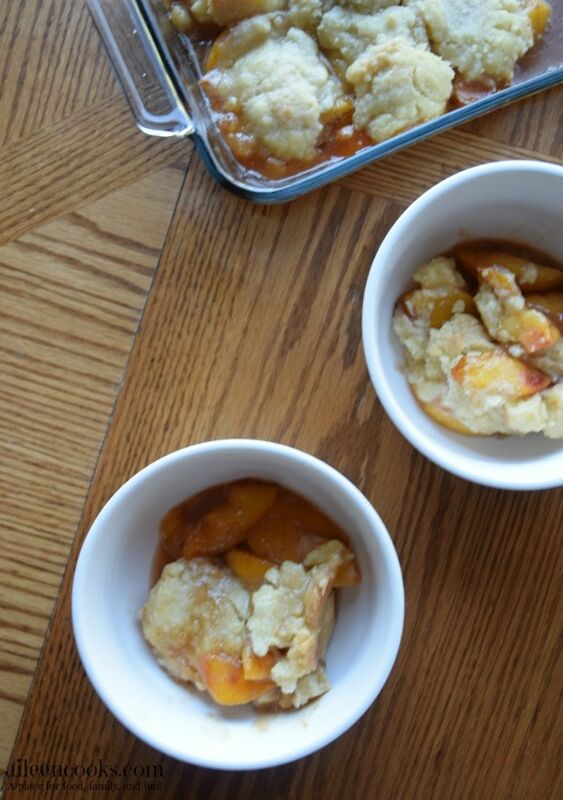 Let the peach cobbler rest for at least 10 minutes (1 hour is preferred) before serving. Frozen peaches may be used in place of fresh for this peach cobbler recipe, but they will need to be defrosted and drained. I look forward to baking homemade peach cobbler every year and it never disappoints. I hope you enjoy this delicious dessert as much as we do! 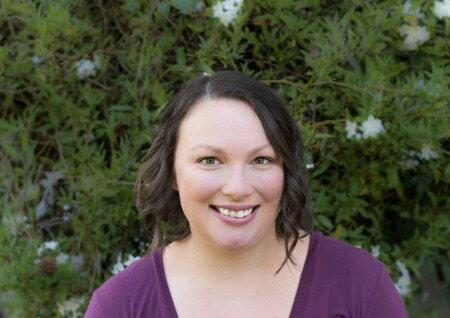 Thanks Aileen for explaining the difference on using freestone peaches. I always hated loosing the extra fruit when removing the pit. The cobbler looks so mouthwatering. Looking forward to trying it.